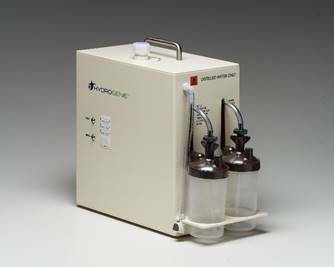 Hydrogen inhalation devices are available in the United States and are already in wide use in Japan and China. In Hydrogen for Surgery & ICU we saw a high-end hydrogen oxygen inhaler for surgery and intensive care that is under development that will go for thirty thousand dollars when approved by the FDA. This article is devoted to the different options available for patients themselves and for clinics, units that will deliver most, if not all the benefits of a thirty-thousand-dollar machine for between two and six and a half thousand dollars. Hydrogen inhalers are like cars, if they are not broken they will take you from point A to B. Meaning they all will work because they all put out the same hydrogen and often oxygen gases. Hydrogen inhalation goes perfectly with hydrogen water, otherwise known as hydrogen rich water. For a few years there have been hydrogen water machines that put low amounts of hydrogen into one’s drinking water. Mine sits in the closet along with my water ionizer, which puts out high pH but low alkalinity and low hydrogen. Molecular hydrogen water machines cannot stand up to hydrogen inhalers or even high ppm hydrogen water tablets. Most hydrogen inhalers will saturate the body quickly. Inhalation of hydrogen reaches a peak plasma level (i.e. equilibrium based on Henry’s Law) in about 30 min, and upon cessation of inhalation the return to baseline occurs in about 60 min. This levels the field between the different machines when factoring in their different flow rates of hydrogen gas, which range between 2 and 99 percent. Basically, the higher the hydrogen concentration the less flow rate a machine needs to push hydrogen into the body. The Hydrogen Technologies inhaler is the Mercedes or BMW of the hydrogen inhalation machines. No other machine comes close to touching it in terms of durability, quietness, ease of use and ability to run 24/7 meaning all night long if needed. 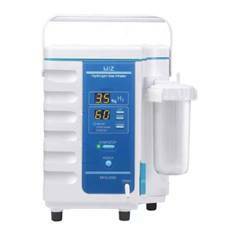 This Molecular Hydrogen/Oxygen Generators is the highest quality electrolysis machine on the market. Its patented generator design is made from stainless steel, which is used extensively throughout their machines. Their engineers believe that the use of plastics and polycarbonates may have a detrimental effect on the quality of the gas when used over long periods of time. Used as directed and maintained at the recommended service schedule, their machine is expected to last well beyond 10 years and can be run 24 hours a day. It outputs 66 percent hydrogen and 33 percent oxygen gas. Supply is limited so if one needs a unit in a hurry it is best to consider another hydrogen inhaler. 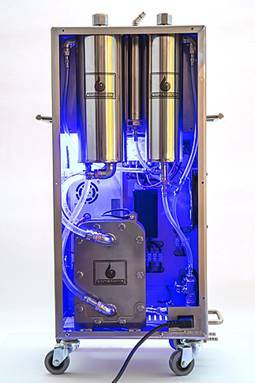 At 400ml of hydrogen gas produced per minute, it is a high concentration per volume producing machine. 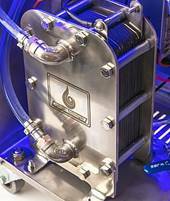 The Hydrogen Technologies machine also produces 200ml of oxygen per minute and its operating temperatures is kept to a very low 40 degrees Celsius. This is important as it keeps the production of water vapor to an absolute minimum which results not only in a higher quality of gas but extended running times without refilling. The large, 15 plate electrolysis cell and tank capacities in the Hydrogen Technologies machine, allow for the efficient production of gas at a low electrical demand and low operating temperature. This allows the generator to produce a full 1800+ liters of gas per liter of water used. The cooler the machine can operate at, the higher the quality of the gas produced, and the increased life span of the generator and components within it. When comparing inhalation models, it should be also noted that all the gas coming out of a machine is not consumed because a breathing cycle is generally 1 third inhalation, 1 third exhaled and a third rest. In this scenario, the intended receiver is only breathing in about 1 third of an inhalers gas mixture. Retail Price 6,495 dollars. Then we have the Vital Reaction 7 percent hydrogen model (7% of 4 liters per minute flow rate) would be delivering 280ml of hydrogen per minute and the Vital Reaction 2 percent machine (2% of 2 liters per minute) yielding about 40 ml of hydrogen. These models are manufactured in Japan where the hydrogen revolution began. The very first hydrogen inhaler I ever recommended was a Vital Reaction 2 percent machine, with a flow rate (two liters a minute). 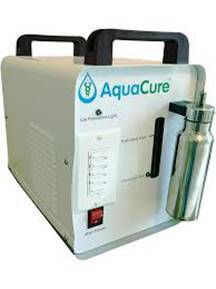 It costs 1,100 dollars more than the AquaCure, which puts out about 1.2 liters a minute of combined gases. The patient using this machine recovered from a brain tumor that was blocking her spinal fluid. These machines are light, portable, easy to use and offer the highest flow rates of any inhalers on the market. They run for a maximum of 90 minutes so are not appropriate for all night use. Price for the VR 7 percent is 5,995 and the VR 2 percent is 3,750 dollars. The Breath of Health hydrogen inhalers from China are interesting in that they offer an attachment tube that lets you combine the oxygen and hydrogen output as well as offering a fleet of esoteric add on technologies (that I have not tested yet) for enhanced performance. Best selection there would be their 600 ml per minute machine. However, I was warned by the distributor to double distill the water used. These machines put out H2 (99.999%) and/or Oxygen O2 (95-99%), delivered from two separate ports. The outflow is set for the Hydrogen H2 Gas at 400 ml/min, Oxygen Gas O2 at 200 ml/min for the Breath of Health 600 ml machine and for the more robust 1000 model its flow rate of 1230 ml/minute the outflow is set for the Hydrogen H2 Gas at 820 ml/min, Oxygen Gas O2 at 410 ml/min making this machine with the highest output of hydrogen, which will saturate the body quicker than other machines, but it is quite a clunker. Retail on the 600 model is 3,199 and the 1000 model is 5,599 dollars. The AquaCure is a practical, lower cost, reliable and versatile hydrogen inhaler that will give you years of trouble free service and is loaded with safety features. The AquaCure can be used continuously with minimal maintenance (just add pure water and clean it about once a year). 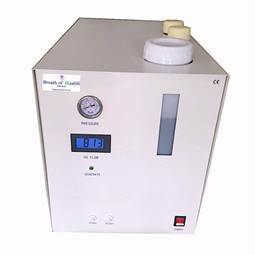 This machine has safety certification, pressure relief, pressure control, variable output, etc., making it one of the best options if you’re looking to own a HydrOxy Inhalation machine. The first two months on hydrogen inhalation I sat working on my computer breathing hydrogen and oxygen gases with my American made AquaCure, which is the oldest manufacturer of hydrogen inhaling machines in the world. I loved it and certainly got a good kick upward in terms of my health, so it is what I recommend for those not able to afford a top of the line hydrogen inhaler. Retail price is 2,499. 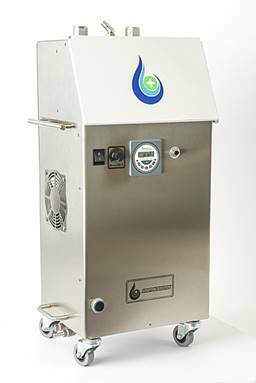 The HydroGenie is the lowest cost machine in this lineup and offers many of the same traits as the AquaCure and retails for 1,997 dollars. 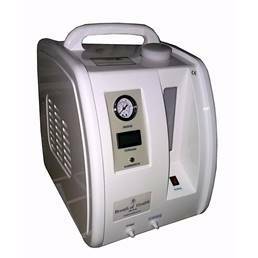 Hydrogen Medicine favors the combining of hydrogen and oxygen gases in therapy however it does not mean you have to get both oxygen and hydrogen from the same machine. 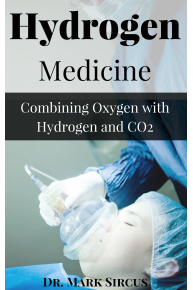 If one chooses a hydrogen inhaler without oxygen output, then it would be ideal to utilize other oxygen therapies that are presented in my Hydrogen Medicine book. Even if one goes with a combined gas inhaler, one’s need for oxygen healing might still necessitate the employment of more intensive oxygen therapies. Personally, I use a singlet oxygen machine all night while sleeping and during the day I soup up my oxygen levels with EWOT, which is Exercise with Oxygen Therapy, so I am just fine using a dedicated hydrogen gas machine. For a few years there have been water machines that put low amounts of hydrogen into one’s drinking water. Mine sits in the closet along with my water ionizer, which puts out high pH but low alkalinity and low hydrogen. 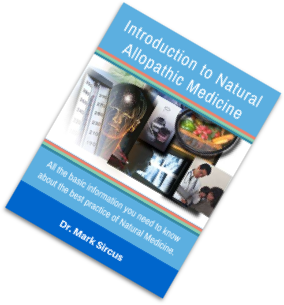 Hi, I'm Dr. Mark Sircus, AC., OMD, DM (P), a doctor and writer of more than 23 books that have sold over 80,000 copies all over the world. 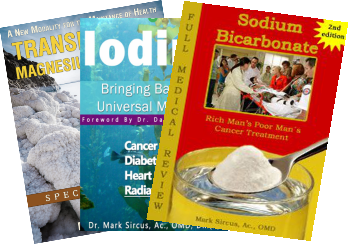 I've been on of firsts to publish on the medical and well-being uses of hydrogen, and I wrote a book about it called - "Hydrogen Medicine". 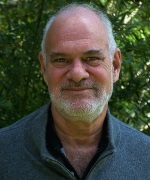 On my website there are hundreds of free articles, but if you need some personalized help, you can make a consultation. Never miss Dr. Sircus updates. Join 90,000 others in my newsletter and get a free ebook!